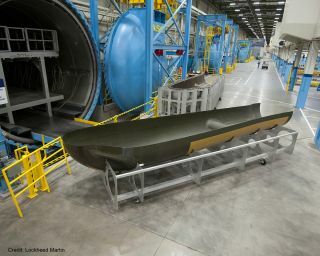 The airframe for the Sierra Nevada Dream Chaser spacecraft at a Lockheed Martin facility in Fort Worth, Texas. The world has gotten its first look at the body of a space plane due to launch into orbit in 2016. The composite airframe of Sierra Nevada Corporation's Dream Chaser space plane, which is designed to carry astronauts into space, was revealed on Aug. 1. The structure will be used in Dream Chaser's first orbital test flight, which is scheduled for November 2016, SNC representatives said. Lockheed Martin builds Dream Chaser's airframe for Sierra Nevada. Lockheed began manufacturing the structure earlier this year at the Michoud Assembly Facility in Louisiana, which is a part of NASA's Marshall Space Flight Center. Assembly is taking place at a Lockheed facility in Fort Worth, Texas. Sierra Nevada hopes that NASA chooses Dream Chaser to ferry its astronauts to and from the International Space Station, beginning in 2017. The agency is encouraging the development of private American astronaut taxis to fill the shoes of the space shuttle, which retired in 2011. SNC is receiving money from NASA under an agency Commercial Crew Integrated Capability (CCiCap) agreement, and so far has 92 percent of the funds promised. Later this year, NASA is expected to announce the next stage of funding in the commercial crew program. It is unclear if all three participating funded companies (which also include Boeing and SpaceX) will receive money at that stage. In late July, SNC also announced that Dream Chaser had passed several major systems tests, and that it had signed two agreements for educational and technological projects related to the spacecraft. The Nevada-based firm has finished risk reduction and technology readiness testing on systems for the crew, environmental control and life support, structures and thermal control and protection. This comes about a month after Sierra Nevada finished other tests on its propulsion and reaction control systems. A prototype of the Dream Chaser space plane built by Sierra Nevada Space Systems is seen at dawn at NASA's Armstrong Flight Research Center in California during its drop-test campaign. Systems were put through their paces in a variety of ways. For example, engineers conducted 1,500 stress tests on the structure and 350 tests to find out which thermal protection system would best protect astronauts as the spacecraft goes through Earth's atmosphere during re-entry, company representatives said. Testing was conducted at several facilities, including NASA's Ames Research Center in California, NASA's Langley Research Center in Virginia, Michoud, SNC's space systems headquarters in Colorado, and Orbital Technologies Corp. in Wisconsin. In late July, Sierra Nevada also signed agreements with Tuskegee University in Alabama and the Japanese Aerospace Exploration Agency (JAXA). The Tuskegee agreement will make the university an educational partner with SNC. Students will work in company facilities through internships, officials with the company will do lectures and curriculum advising, and researchers at the university will join SNC's Dream Chaser program advisory board. Through the JAXA deal, SNC will investigate the potential use of Japanese technologies in Dream Chaser and discuss possibly launching Dream Chaser from Japan, company representatives said.